Saint Vincent is the largest island of the country Saint Vincent and the Grenadines. It is located to the west of Barbados, south of Saint Lucia and north of Grenada in the Windward Islands of the Lesser Antilles, an island arc of the Caribbean Sea., and is composed of partially submerged volcanic mountains. Its largest volcano and the country’s highest peak, La Soufrière, is active, having last erupted in 1979. The island has a total surface area of 133 square miles (344 square kilometers), or about 88% of the total country area, 19 times that of the country’s second largest island Bequia. The coastline measures about 52 miles (84 km). The territory was disputed between France and the United Kingdom in the eighteenth century, before being ceded to the British in 1763 and again in 1783. It gained independence on October 27, 1979. Approximately 100,000 people live on the island. Kingstown (population 25,418) is the chief town. The rest of the population is dispersed along the coastal strip, which includes the other five main towns of Layou, Barrouallie, Chateaubelair, Georgetown, and Calliaqua. Before the arrival of Europeans and Africans in the sixteenth century, various Amerindian groups passed through or settled on St. Vincent and the Grenadines, including the Ciboney, Arawak, and Carib people. These groups likely originated in the Orinoco Valley of South America and migrated north through Trinidad and the Lesser Antilles. By the time Christopher Columbus passed near St. Vincent on his fourth voyage in 1502, the Caribs occupied the island after displacing the Arawaks a few centuries earlier. Columbus and the Spanish conquistadors largely ignored St. Vincent and the smaller Grenadine islands nearby, but focused instead on the pursuit of gold and silver in Central and South America. They did embark on slaving expeditions in and around St. Vincent following royal sanction in 1511, driving the Carib inhabitants to the rugged interior, but the Spanish made no attempt to settle the island. Carib Indians aggressively prevented European settlement on St. Vincent until the eighteenth century. African slaves, whether shipwrecked or escaped from St. Lucia or Grenada and seeking refuge in St. Vincent, intermarried with the Caribs and became known as “black Caribs”. Those of mixed African-Carib ancestry are now known as Garifuna. The first Europeans to occupy St. Vincent were the French. However, following a series of wars and peace treaties, the islands were eventually ceded to the British. 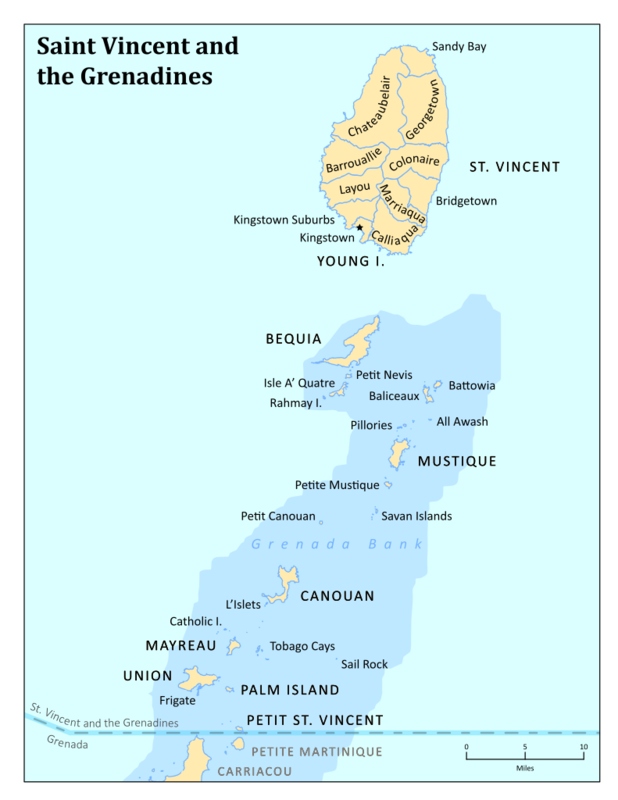 While the English were the first to lay claim to St. Vincent in 1627, the French centered on the island of Martinique would be the first European settlers on the island when they established their first colony at Barrouallie on the Leeward side of St. Vincent in 1719. The French settlers cultivated coffee, tobacco, indigo, corn, and sugar on plantations worked by African slaves. St. Vincent was ceded to Britain by the Treaty of Paris (1763), after which friction between the British and the Caribs led to the First Carib War. The island was restored to French rule in 1779 and regained by the British under the Treaty of Versailles (1783). Between 1795 and 1796, with French support from Martinique, the Black Caribs, led by their chief, Joseph Chatoyer, fought a series of battles against the British. Their uprising was eventually put down, however, resulting in almost 5,000 Black Caribs being exiled to the tiny island of Baliceaux off the coast of Bequia. Conflict between the British and the black Caribs continued until 1796, when General Abercrombie crushed a revolt fomented by the French radical Victor Hugues. The British deported more than 5,000 black Caribs to Roatán, an island off the coast of Honduras. Like the French before them, the British also used African slaves to work plantations of sugar, coffee, indigo, tobacco, cotton and cocoa until full emancipation in 1838. The economy then went into a period of decline with many landowners abandoning their estates and leaving the land to be cultivated by liberated slaves. Life was made even harder following two eruptions of the La Soufriere volcano in 1812 and 1902 when much of the island was destroyed and many people were killed. In 1979 it erupted again, this time with no fatalities. From 1763 until independence, St. Vincent passed through various stages of colonial status under the British. A representative assembly was authorized in 1776. Decades after the success of the Haitian Revolution, the British abolished slavery in 1834. The resulting labor shortages on the plantations attracted Portuguese immigrants in the 1840s and East Indians in the 1860s as laborers. Conditions remained harsh for both former slaves and immigrant agricultural workers, as depressed world sugar prices kept the economy stagnant until the turn of the twentieth century. The islands first began to issue stamps on May 6, 1861, and featured Queen Victoria. A Crown Colony government was installed in 1877, a Legislative Council created in 1925, and universal adult suffrage granted in 1951. 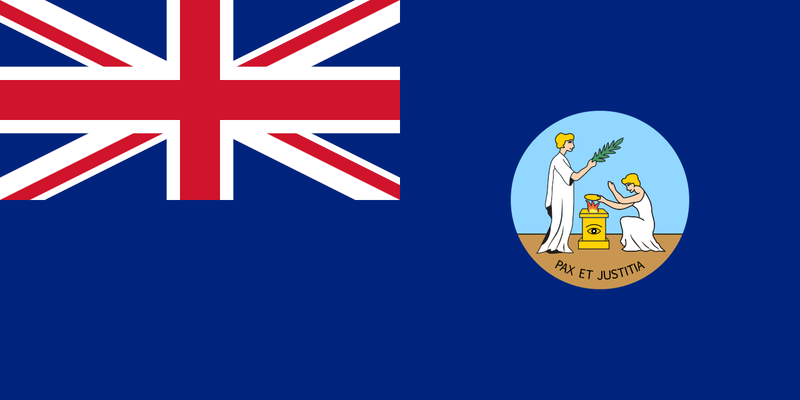 During this period, the British made several unsuccessful attempts to affiliate St. Vincent with other Windward Islands in order to govern the region through a unified administration. The most notable was the West Indies Federation, which collapsed in 1962. 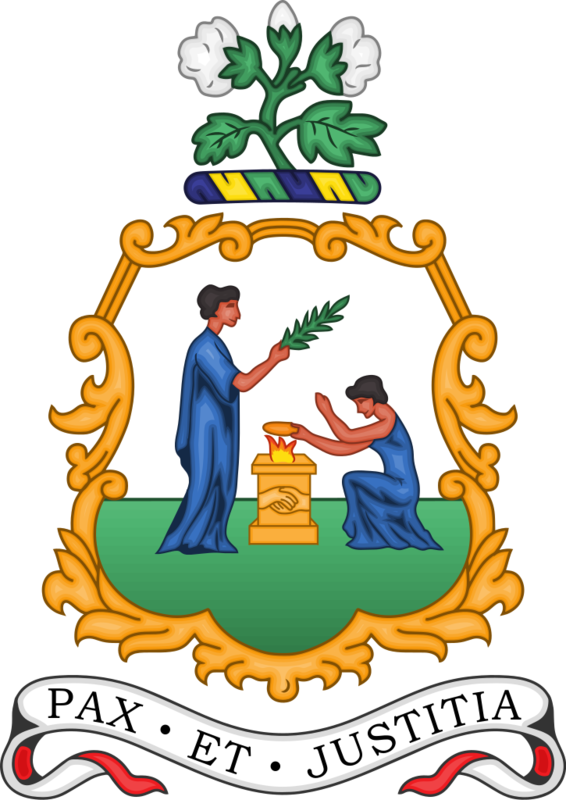 St. Vincent was granted associate statehood status on October 27, 1969, giving it complete control over its internal affairs. 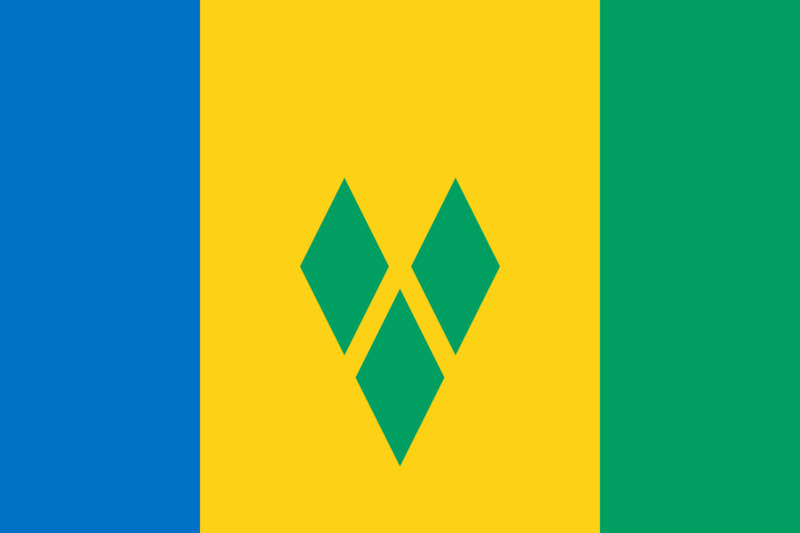 Following a referendum in 1979, St. Vincent and the Grenadines became the last of the Windward Islands to gain independence on October 27, 1979. Natural disasters plagued the country throughout the twentieth century. In 1902, Soufrière volcano erupted, killing 2,000 people. Much farmland was damaged, and the economy deteriorated. In April 1979, La Soufrière erupted again. Although no one was killed, thousands had to be evacuated, and there was extensive agricultural damage. The island also suffers from hurricanes. On September 11, 1898, six hours of a terrible hurricane devastated Barrouallie, which was almost completely destroyed. More recently, in 1980 and 1987, hurricanes devastated banana and coconut plantations; 1998 and 1999 also saw very active hurricane seasons, with Hurricane Lenny in 1999 causing extensive damage to the west coast of the island. Scott #40 is a 2½ pence surcharge on a 1 penny lake stamp recess printed by Thomas de la Rue & Company Limited from plates engraved by Perkins Bacon & Company Limited. 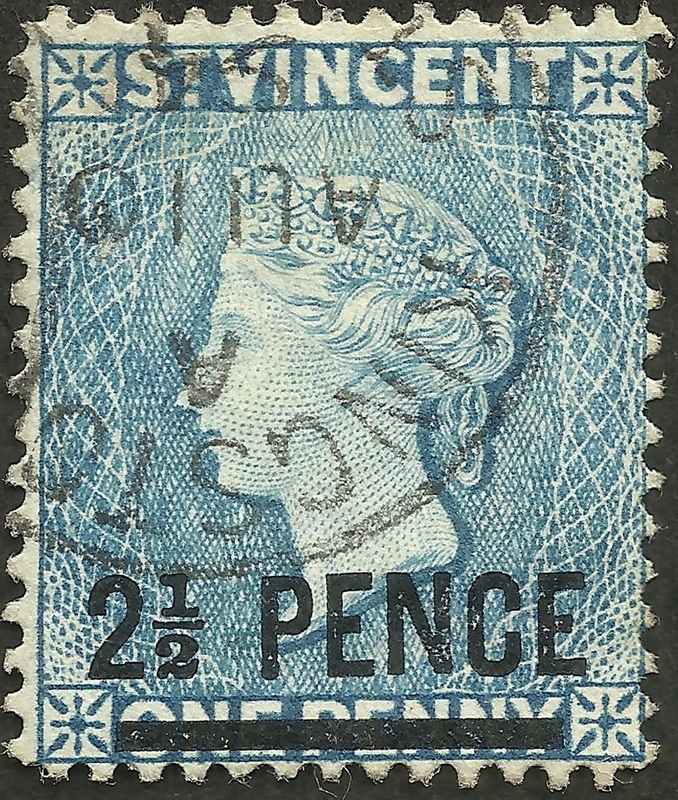 Released in 1883, it was watermarked with a Crown CA and perforated 14. Stamps were inscribed ST. VINCENT until independence in 1979 but the full name of Saint Vincent & the Grenadines was rarely printed on stamps until well into the 1990s.